Stickers for switches in English language. 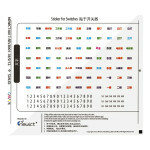 Stick directly onto switches, keys, padlocks, doors and a..
Stickers for switches in Mandarin. 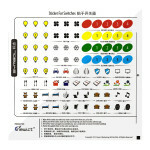 Stick directly onto switches, keys, padlocks, doors and any locat..
Stickers for switches in Icon with numerics. Stick directly onto switches, keys, padlocks, doors and..